The colours in Evie's room are Dulux paints - Antique White USA and the pink trim is Marshmallow Magic. Her furniture is from the Amani Babyhood Range and from Bubs and Grubs. It's delivered very promptly and they had wonderful customer service. The furniture was easily put together. My husband put together the cot but I put together the change table and her drawers. :) We got the 7 piece package down the bottom. We have also used Bubs and Grubs for Evie's Mamas & Papas Dream Swing , her Oricom Secure 200 baby monitor and her Twilight Turtle nightlight. We get soooo many comments about her wall decal from My Friend Matilda. It is stunning in her room, adding a beautiful splash of colour and it was simple to put up by my mother and myself. You could easily put it up mostly by yourself although it was handy to have an extra set of hands on the curly branches. Her bunting was bought from the madeit website through the seller Chester and Lolly. Her cot has a handmade quilt sewed by my Nanna (Evie's great Nanna) with owl fabric bought from funkyfabrix. They have a great range of fun fabrics and are reasonably priced with quick postage. The remainder of the owl fabric got cut out and attached to the bottom of her curtains with vliesofix. Her curtains are sewn by me with fabrics from Spotlight. You can pick vliesofix up from most craft stores and I believe Spotlight sells it also. She also has a hand crocheted granny square blanket made by myself with 100% machine washable merino yarn from Bendigo Woollen Mills in Wild Orchid and Wild Apple. Evie's little cot friend in the top image is her stuffed owl from Plushka on madeit. There were a few other sellers on madeit selling similar owls but the Plushka ones seem to look like they are made much better. Above Evie's cot hangs her Tiger Tribe Owl mobile which was a gift from one of my beautiful friends bought from UrbanBaby. Her canvas is created with photography by me using my favourite canvas supplier. Another of my friends made her name wall hanging which is gorgeous on her wall and everyone loves it. 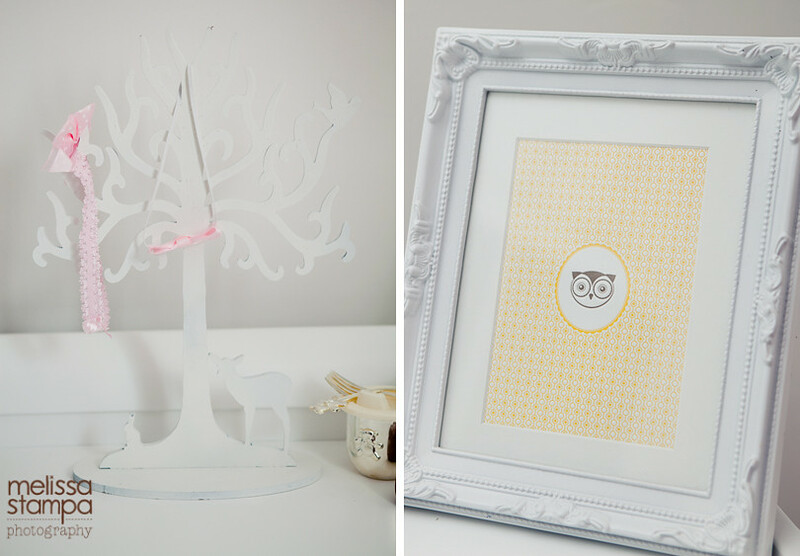 On her dresser is a photo frame from Big W with a handmade letterpress owl print from letterpress on etsy who are based all the way over in Austin Texas. The owl print arrived quickly and was packaged beautifully. It's on heavy card that feels and looks divine. I've used letterpress a couple of times now and love them. Her tiny owl in the bottom image is from an Australia Post store. Lastly her little silver frame is another Big W one with little cards inside from the Daisy Lane swapcards pack 1 available at Lark which is one of my favourite online shops. I first stumbled across Lark when I was shopping for a cupcake stand for my baby shower while I was pregnant with Evie and found this gorgeous one - Regency Mis-matched China Cake stand. 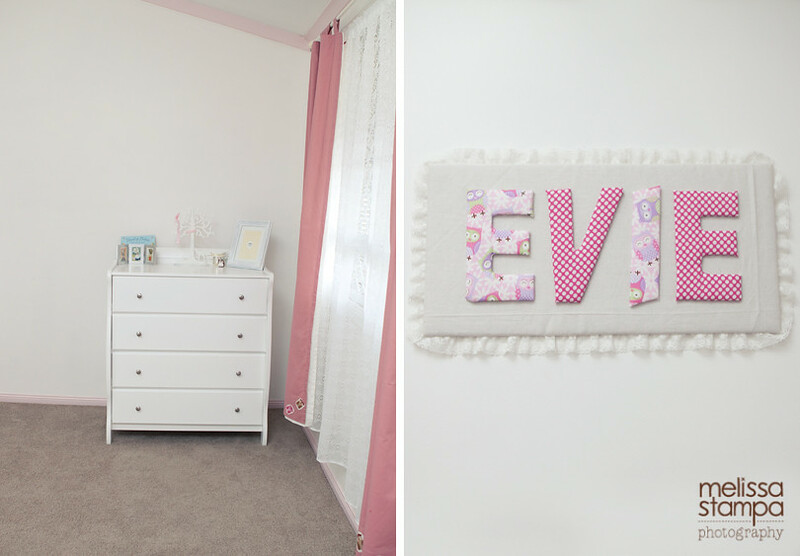 I hope you've enjoyed the sneak peek into Evie's nursery! Wow! What an absolutely divine nursery! I love all the little touches and it all comes together so well :) Particularly love the wall decal and the little tree - so cute! Oh wow Melissa this nursery is GORGEOUS!!! just love it! This is so beautiful and you are so clever!! Melissa you should go into interior design for children...honestly, it's a talent. That's the most beautiful and well thought out nursery I have even seen! I agree with Hayley, you have a huge talent here too. Wow, its taken me a while to get to commenting as Ive been entranced by the room ... it is perfect!